If this card is destroyed by battle or card effect: You can Special Summon 1 "Six Samurai" monster from your Deck, except "Secret Six Samurai - Fuma". If exactly 1 "Six Samurai" monster you control (a.. When this card is Normal Summoned: You can target 1 of your banished "Six Samurai" monsters; add it to your hand. If exactly 1 "Six Samurai" monster you control (and no other cards) would be destroyed..
You can banish 2 "Six Samurai" monsters from your GY and/or face-up from your field, then target 1 "Six Samurai" monster in your GY, except "Secret Six Samurai - Hatsume"; Special Summon it. You can o.. When another "Six Samurai" monster is Normal or Special Summoned to your field (except during the Damage Step): You can send 1 "Six Samurai" card from your Deck to the GY. If exactly 1 "Six Samurai" m.. When this card is Special Summoned: You can add from your Deck to your hand, 1 "Six Samurai" monster with a different Attribute from every monster you control. If exactly 1 "Six Samurai" monster you c..
3 "Six Samurai" monsters with different Attributes. Must first be Special Summoned (from your Extra Deck) by sending the above cards you control to the GY. (You do not use "Polymerization".) Cannot be..
You can only control 1 "Grandmaster of the Six Samurai". 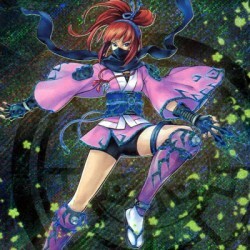 If you control a "Six Samurai" monster, you can Special Summon this card (from your hand). If this card in your possession is destroyed by an o.. If you control a "Six Samurai" monster with a different name, you can Special Summon this card (from your hand). While you control 2 or more other "Six Samurai" monsters, this card gains 300 ATK and D..
1 Warrior Tuner + 1+ non-Tuner "Six Samurai" monsters. Once per turn, when your opponent activates a Spell/Trap Card (Quick Effect): You can negate the activation, and if you do, destroy it. If this c..
2 Level 4 "Six Samurai" monsters. Once per turn (Quick Effect): You can detach 1 material from this card, then target 1 "Six Samurai" monster you control with less than 2000 ATK; its original ATK beco..
Each time a "Six Samurai" monster(s) is Normal or Special Summoned, place 2 Bushido Counters on this card. You can remove Bushido Counters from your field to activate these effects. :- 2 Counters: Tar..
During either player's turn, you can activate "Magical Musket" Spell/Trap Cards from your hand, if a Spell/Trap Card is activated in this card's column: You can add 1 "Magical Musket" card from your D..
During either player's turn, you can activate "Magical Musket" Spell/Trap Cards from your hand. If a Spell/Trap Card is activated in this card's column: You can add 1 "Magical Musket" card from your G..
During either player's turn, you can activate "Magical Musket" Spell/Trap Cards from your hand. If a Spell/Trap Card is activated in this card's column: You can discard 1 "Magical Musket" card; draw 2..
During either player's turn, you can activate "Magical Musket" Spell/Trap Cards from your hand. If a Spell/Trap Card is activated in this card's column: You can Special Summon 1 Level 4 or lower "Magi..
During either player's turn, you can activate "Magical Musket" Spell/Trap Cards from your hand. If a Spell/Trap Card is activated in this card's column: You can target 1 "Magical Musket" monster in yo..
During either player's turn, you can activate "Magical Musket" Spell/Trap Cards from your hand. If a Spell/Trap Card is activated in this card's column: You can target 3 "Magical Musket" cards in your..
You can Tribute Summon this card face-up by Tributing 1 "Magical Musket" monster. During either player's turn, you can activate "Magical Musket" Spell/Trap Cards from your hand. Once per turn, during ..
Target 1 "Magical Musket" monster you control; its ATK/DEF become double its original ATK/DEF until the end of this turn. It cannot attack directly during the turn you activate this card. You can only.. If you control a "Magical Musket" monster: Target 1 face-up monster on the field; until the end of this turn, change its ATK/DEF to 0, also it has its effects negated. You can only activate 1 "Magical..
"Magical Musket" monsters you control cannot be destroyed by card effects. If this card in your possession is sent to your GY by an opponent's card effect: You can add 1 "Magical Musket" card from you.. When your opponent activates a Spell/Trap Card while you control a "Magical Musket" monster: Negate the activation, and if you do, destroy that card. You can only activate 1 "Magical Musket - Last Sta..